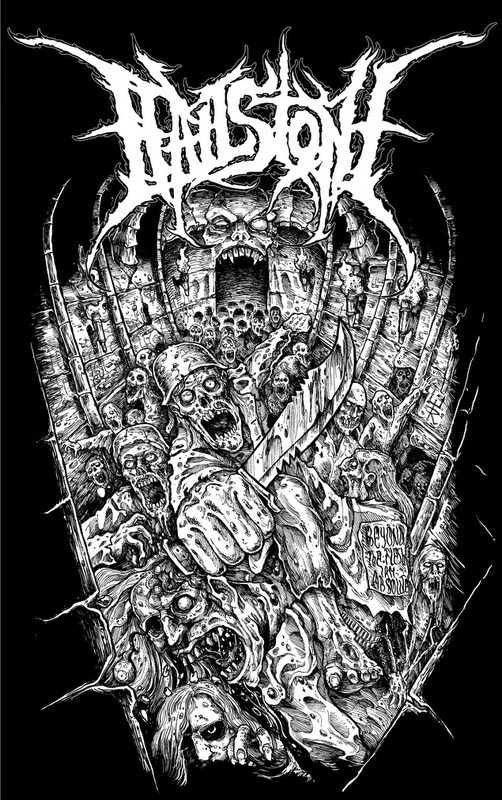 We are all sold out of our Catacombs zippers, but there are still tons of cool merchandise items available in our shop. Get them while they're still there! Check out our new merchandise in our shop! We have new girlie shirts and tanks as well as hoodies, each with our logo on them. Get them while they're still fresh! Thanks to everyone at 8below in Munich. As usual, everything was organized very well and we had a great time. Also, huge shoutouts to Divide who stepped in on a short notice and totally rocked the house! Huge shoutouts to the Club From Hell in Erfurt and to the Juze Peiting for a great weekend! We had a lot of fun and everything went very smoothly. We'd be very happy to play at those locations again. If you couldn't come see us last weekend, make sure to come by 8Below in Munich to watch our show on Friday, March 29. We've got new apparel for you. 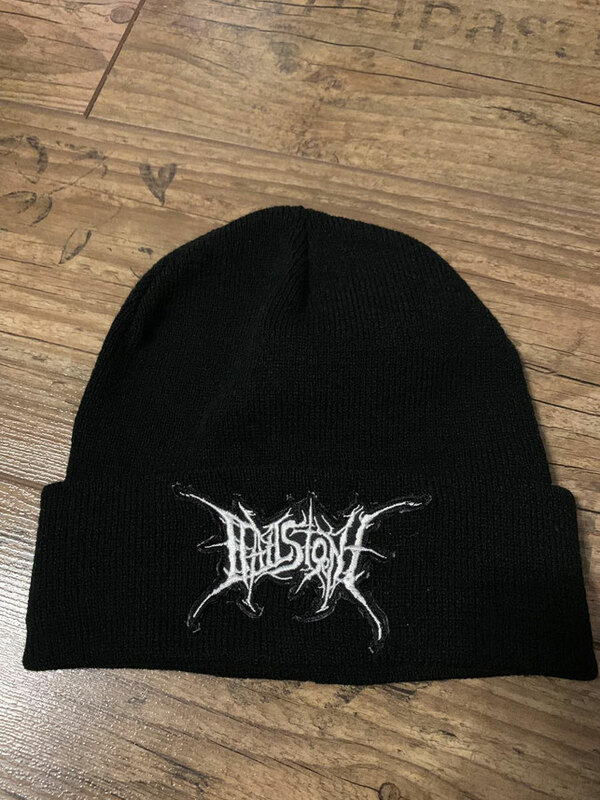 Check out our new Hailstone beanies in our shop. Get them while they're still hot! In the following weeks, we'll be playing a couple of gigs. Come see us at From Hell in Erfurt on Friday, March 22, where we will play alongside Illdisposed and Path of Destiny or on Saturday, March 23, at the Juze in Peiting alongside Splicer and Libation. One week later, on Friday, March 29, you can see us at the Friday Madness Party at 8Below in Munich with the great talents of Divide. Stay tuned for more information in our Concerts section. We're looking forward to seeing you at one of the events and having a great time! Our second album, Epitome is finally available on several digital platforms again. You can listen to the album for free on Spotify, Amazon Unlimited and similar services or you can buy a digital copy at CDBaby. Now you can listen to Epitome whenever and wherever you want! In September, Hailstone is proud to get the chance to play in Mlada Boleslav in Czechia. More details on this gig will follow soon. You will see all the details in our concerts section. We wish all you metalheads out there a happy new year 2019! We would like to give huge shoutouts to everyone involved in the Metallic X-Mas event at the end of the previous year. It was a great success and we had a lot of fun playing there and meeting everyone. Coming up in the new year, we will play a bunch more shows around Germany, starting this weekend in Kaiserslautern. Check out our new live schedule in the Concerts section of the homepage. See you very soon at a location of your preference! Metallic X-Mas is coming up! On December 26th we're proud to have the opportunity to play at the Metallic X-Mas 2018 at Backstage Werk. Check out the recently published running order of the event! Join us at the end of December to enjoy Christmas with a variety of awesome metal bands. Get your tickets while they are still available! Check out this awesome video from our trip to the Meltdown Festival and to Denmark! Thank you to Metal im Woid! Huge thanks to everyone involved in the Metal im Woid Festival! We had a really nice time playing at this great event. Everything went very smoothly and everyone was perfectly organized and friendly. We would be honored to play at this festival again. Thanx to everyone at Meltdown Festival! Thank you to everyone at the Meltdown Festival in Schuby! We had a great time, everything was very well organized and the audience was amazing! Stay tuned for some impressions of the festival coming soon. Hailstone plays at Metallic Xmas! On Wednesday, 26 December 2018, we'll be playing at the Metallic Xmas show at the Backstage Werk in Munich. We'll perform alongside Onkel Tom Angelripper, Nocturnal and other great bands. So get your tickets now and don't miss this awesome event! Iridum Stream recorded the opening track of our show at the Bavarian Battle Open Air 2018. Enjoy this professional, multi-cam video. Big props to Iridum Stream and Sick Of Sound Studios. Thank you for everything, BBOA! Thank you for a very successful festival! Great bands, great organization and a very relaxed athmosphere! We're grateful to have been part of this event! For christmas we've got something special for you: We've just ordered a batch of awesome zippers! They are limited in number, so pre-order your zipper now! The zippers will be shipped starting December 22nd, 2017. Make sure you make use of our end-of-the-year-special: Order your zipper by December 31st, 2017, and you only pay 30€ plus shipping!! !